For anyone considering hiring tree crews that are not bonded or fully insured, there may be some serious repercussions; property owners would have to accept a huge amount of risk. Who Needs Commercial Insurance for Tree Removal and Stump Grinding? While there is no specific "tree removal and stump grinding" policy, if your business includes any of the following services, then you need some comprehensive coverage. What is a BOP and what can it do for you? An insurance policy that combines coverage for liability and property, one that is designed for small to mid-sized businesses, is known as the business owners policy(BOP). Combining these policies typically saves you money. The professionals at CommercialInsurance.net can help you assess your specific risks and get you the right coverage to protect your business investment. Whether you are just starting out or you have an established business that needs to re-evaluate its existing coverage, here are some of the risks related to tree removal and stump grinding services. 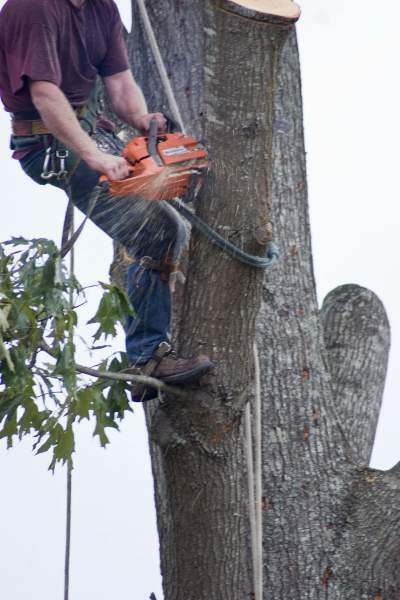 Professional liability insurance: If you provide consulting or tree care advice, "errors and omissions" insurance covers you against liability claims due to poor advice, negligence, or recommended services that result in a client's loss. Commercial vehicle insurance: This insurance policy will provide coverage specific to your commercial vehicles and drivers. Business interruption/loss of income insurance: If your business has been forced to shut down due to catastrophic events, i.e., gas line explosion, tornado/hurricane devastation, etc., this policy covers ongoing operational costs and employee pay at a temporary location. Workers compensation: This policy will cover job-related injuries/illnesses and lost income. Workers comp is required in all states; in some states, you only need to carry workers compensation if you have three or more full-time employees. In other states, you need to carry a basic workers compensation policy regardless of the number of employees. There are many other optional coverages to consider. Be sure to discuss your specific concerns and requirements with an insurance specialist at CommercialInsurance.net who can customize coverage for your operation. Regardless of whether you have a large tree crew and tree care professionals or a small tree trimming operation, you need the right types of affordable insurance coverage. Go online today, CommercialInsurance.net., and fill out the form or contact an insurance specialist at 1-877-907-5267.